super fantastic! I loaded an empty Copic marker w Gamsol. Works a treat. Intense, fabulous color! I've seen this set in use before and I think it's so cute. Love the sentiment with it. I'm extremely intrigued with your method of using Copics over Prismas. Also interested in Toni's idea. I have a spare marker I could use. I shouldn't visit more than one blog a day because I come away with too many ideas to try, sheesh. Wow! Love your coloring. Thanks for the tip about using the colorless blender. I had gamsol, but didn't use it often, and it evaporated! Just gorgeous and a great idea! Love your coloring! The colors that you used are so nice and vibrant! Love love this card Joan. I have never tried this technique. Will have to give it a go. TFS. 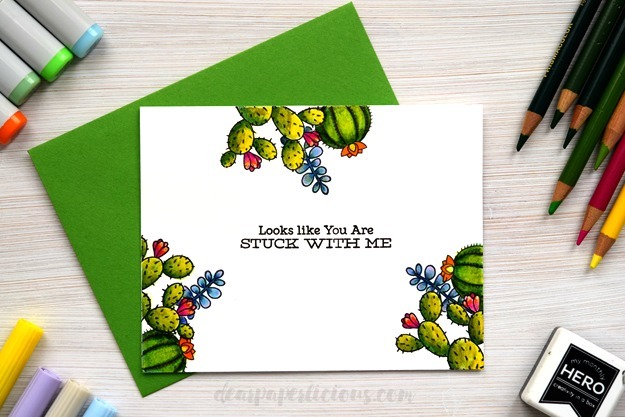 I love the way you framed your sentiment with the brightly colored succulent images!! This is fabulous!